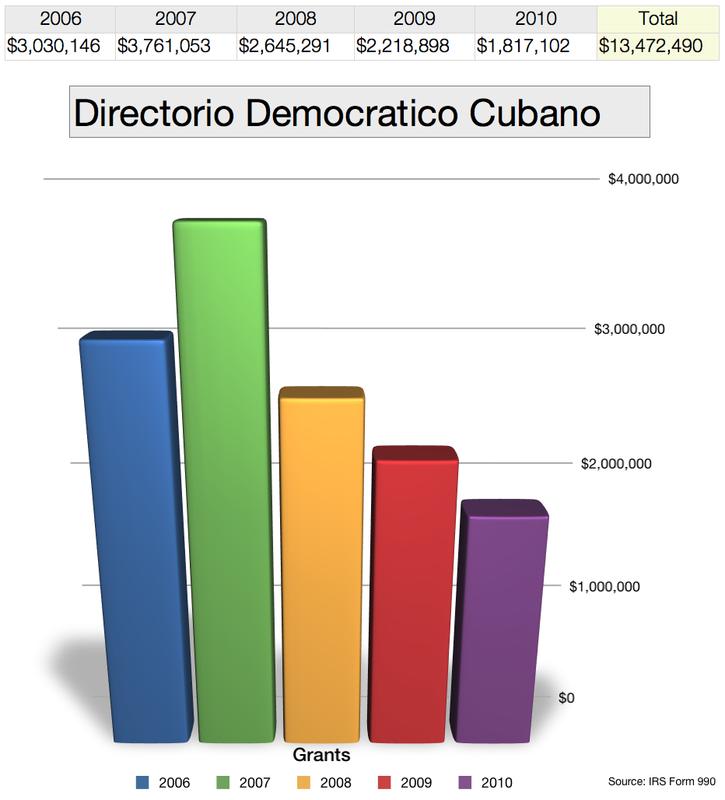 A Florida non-profit organization called Directorio Democratico Cubano received $13,472,490 in grants from 2006 through 2010, tax records show, but only a small fraction of that money reached dissidents and human rights activists on the ground in Cuba. The organization's IRS Form 990 for the year 2010, for instance, lists $25,035 as humanitarian aid for 98 individuals. That works out to about $21.29 per month per person - or 70 cents per day in humanitarian aid. The Form 990 also lists $53,660 in "support for civic activities." That money went to 216 individuals. That works out to $20.70 per month - or 68 cents per day - for "civic activities." The form also shows $25,993 for "island transportation" to 104 recipients. That's $20.82 per month - or 71 cents per day. Suppose you're a dissident in Cuba and you receive all three sources of funding, you'd get just $62.81 per month or $753.72 per year. That contrasts greatly with the salaries paid to the organization's directors, three of whom receive $48,000 or more per year. The U.S. Agency for International Development has published details of its latest humanitarian assistance program targeting Cuba. Download the 40-page notice here. The U.S. Agency for International Development has released some new details on its planned digital democracy program in Cuba. Excerpts from the agency's request for applications is below. Download the full document 42-page here. The agency says it plans to use new and existing technology to increase the flow of uncensored information to and from Cuba. Given the nature of the regime in the country of operations and the political sensitivity of the USAID Program, USAID cannot be held responsible for any injury or inconvenience suffered by individuals traveling to or operating in the country under USAID funding. Except as otherwise provided in the agreement, the Recipient accepts the risks associated with required recipient performance in such operations. Note use of the term "inconvenience." That's a real understatement. Getting thrown in prison isn't just inconvenient. So it doesn't take great numbers to form an organization that can potentially receive democracy funds. 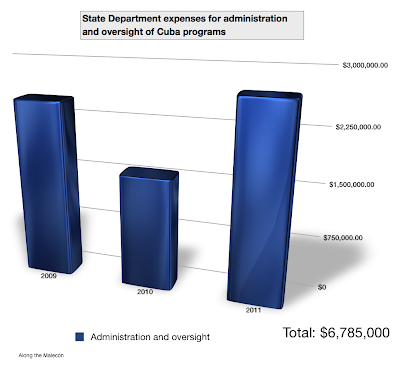 Over the past three years, the State Department has set aside more than $6.7 million for administration and oversight of Cuba programs. But don't be misled by the word "oversight." It has little to do with transparency or being accountable to taxpayers. I have filed Freedom of Information Act requests for audits of the Cuba programs - audits that cost taxpayers millions of dollars - and I've gotten almost nothing in return (see more on FOIA requests here). Perhaps the State Department is accountable to private contractors and non-governmental organizations, who are allowed to tell the government what documents and what material can be released in response to FOIA requests. But good luck trying to get any documents if you're a journalist or a citizen. It is an uphill fight. It may be a little unfair to say that the State Department oversees itself. After all, the agency contracts out much of the work - audits of the Cuban programs, for instance. But suppose you're a private contractor getting $1 million or $2 million for an audit. You are going to do whatever you can to protect your interests and your bottom line. There is no motive for transparency. There's no motive to publicly disclose any shortcomings in the Cuba programs or to be accountable to the public. That sort of thing could ruin a sweetheart deal with the State Department. Here's the sleeve of an original shirt from the 26th of July movement that Fidel Castro led during the Cuban revolution. The governments of Cuba, Bolivia, Ecuador, Dominica, Nicaragua and Venezuela demand that the U.S. Agency for International Development withdraw immediately from their countries. 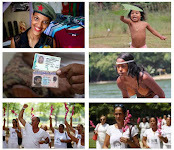 The six nations are part of the Bolivarian Alliance for the Peoples of our Americas, ALBA by its Spanish initials. The nations' respective foreign ministers asked USAID to cease operations in their countries in a June 21 statement released in Rio de Janeiro. Cuba's Granma newspaper published the statement here, in Spanish. The countries accuse USAID of interfering with their domestic affairs. They say that under the pretext of "planning and managing U.S. economic and humanitarian assistance in the world," USAID "funds non-government organizations, actions and projects aimed at destabilizing legitimate governments, which do not respond to its interests." Critics of the Cuban government argue that the socialist government is not legitimate because it deprives people of basic freedoms. And they say Cubans can't change their own government without outside help. What did USAID do with the money? 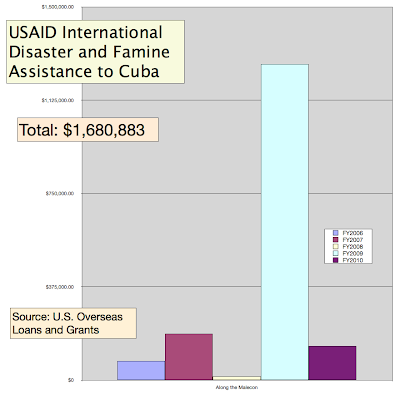 USAID's Cuba budget records list more than $1.6 million in International Disaster and Famine Assistance funds. I've come across this sort of thing before and have never been able to figure out how such money was used. We don't have diplomatic relations with Cuba. 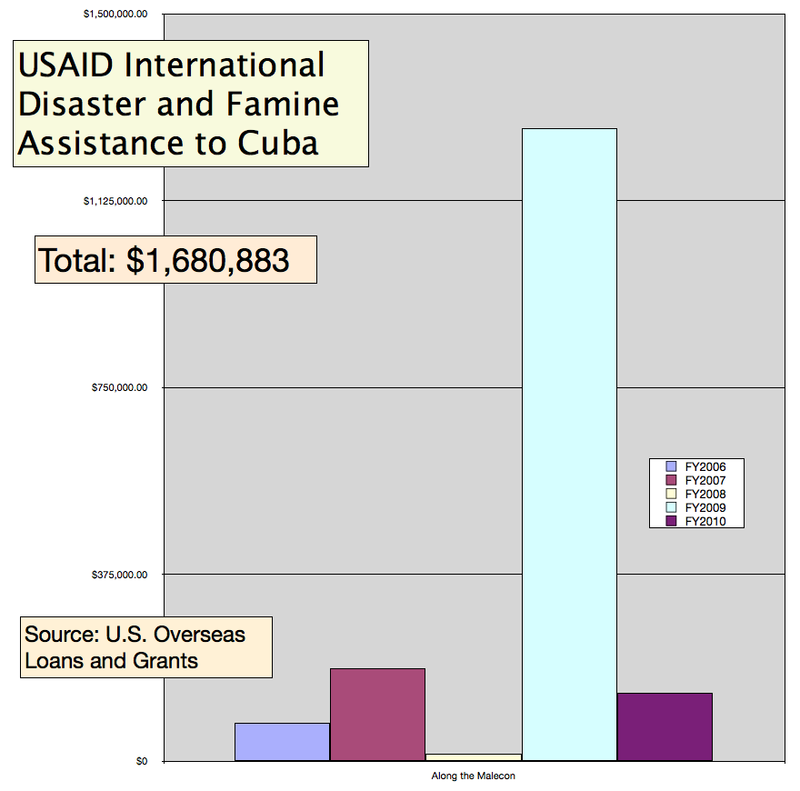 The Cuban government, as far as I know, doesn't usually accept disaster relief money from the United States. Or does it? 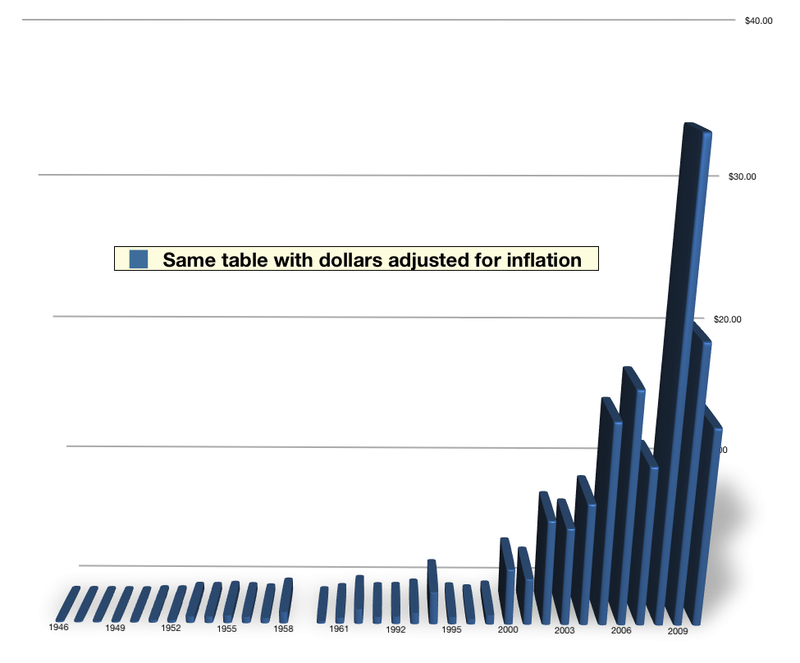 I wonder whether the disaster money - purportedly spent from 2006 to 2010 - was diverted toward something else. I was looking around on USAID's website and came across a page called U.S. Overseas Loans and Grants. It contains some historical data on U.S. economic assistance to Cuba. 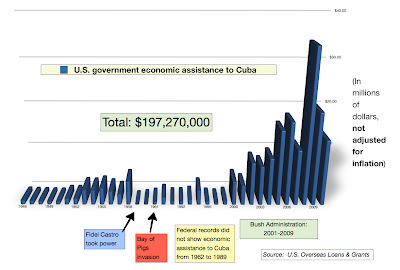 These numbers don't represent all U.S. government spending on Cuba-related programs. Most of this is USAID and State Department money. I found the numbers interesting because they show spending amounts over time. The Overseas Loans and Grants website use the term "economic assistance," but this clearly isn't money that went to the Cuban government after 1959. U.S. agencies spend the money without Cuban government permission. It would be interesting to add military and intelligence agency spending, but I don't have those figures. I made these charts using data from the Overseas Loans and Grants website. Dollars not adjusted for inflation in the chart above. 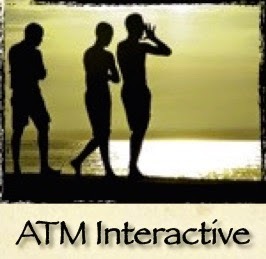 Below dollars are adjusted. 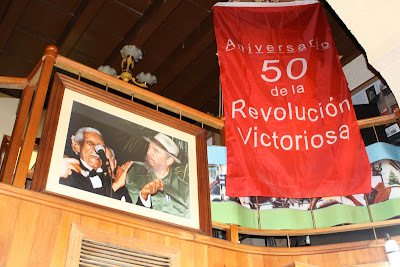 Bloggers curious about visitor traffic won't be able to use Google Analytics anymore in Cuba. The Cuban government on Tuesday called it "outrageous censorship." Google said it was a "technical block" aimed at complying with U.S. trade sanctions against Cuba. Apple has blocks of its own. Just try listing your country of origin as Cuba when registering an iPad. The iPad list doesn't include Cuba - as if the country didn't exist. 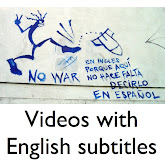 It reminds me of some of the ridiculous Caribbean travel guides that omit Cuba entirely. Anyway, I didn't intend to buy an iPad anytime soon, but I am working on an iBook and I quickly learned that you can't preview your work unless you tether your computer to an iPad. Armed with that wonderful excuse, I bought a new iPad earlier this week. Here's my iPad showing one of the Cubans who appears in the iBook. He's holding two motorcycle engines. "Look, I'm a V-twin," he said. My book is about Cuba - no surprise there. It'll contain dozens of stories and many hundreds of photos. I hope to send it to the iTunes store late next week. Most of the book is done and loaded into iBooks Author, a pretty nifty tool. But I am not done writing. I still have five or six chapters to go and was listening to a few final taped interviews this morning. I've read that Apple's approval process can take weeks, even months, and there's no guarantee the book will be accepted. But I'll post any news once I have it. This man found a prime spot to relax and get out of the rain in the Cuban countryside. He waved as I drove by. The Broadcasting Board of Governors is exploring the idea of hiring a single company to manage its government-paid journalists in Central America and the Caribbean, including Cuba. The BBG, which oversees the Voice of America, the Office of Cuba Broadcasting and other operations, asks interested companies to submit their qualifications for such work by June 28, according to FedBizOpps.gov. demonstrated experience relative to staffing and managing a workforce of at least 100 full-time employees providing to news organization and Government customers (with very general guidance from, but NOT supervision by, those customers). A June 13 notice says the BBG has not committed to the consolidation plan and is merely exploring its options. The BBG is seeking a company capable of providing regular reports from journalists presently residing in the Central American and Caribbean region. The journalists would conduct interviews and provide fair, accurate, balanced and objective news and feature stories in Spanish for broadcast on radio, television, mobile and web as required, including breaking news, and deliver news reports and work on short deadlines. Journalists should also be able to gather and provide photographs and video and should be able to both pitch their own stories and respond to the needs of the BBG newsrooms. I spotted this photo at a shop in Old Havana. I don't know who took it. Around lunchtime one day, I shot a few photos of Ricardo Alarcón, president of Cuba's National Assembly of People's Power, as he left a restaurant along the Carretera Central (Central Highway), east of Havana. Scenes from a Havana dog shelter. Slurp, slurp. Minrex: Health of Alan Gross is "normal"
Mr. Alan Gross´ health is normal. He has chronic conditions typical of someone his age, and is being properly treated for them. He is eating healthy, balanced meals. His general state of good health can be seen by the fact that he is maintaining a considerable exercise program. The Government of the United States and Mr. Gross´ family have been regularly receiving complete medical information about his health. Cuban authorities have periodically been meeting with U.S. officials and Mr. Gross´ family in order to share all information about his health. 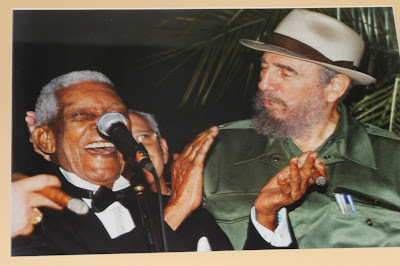 The Government of Cuba regrets the distortions that are being spread on the subject of Mr. Gross´ health and respects his right to the privacy of doctor-patient information. Cuba demands that this campaign of fabrications ceases; should it continue, there will be no other alternative than to publish abundant information on the subject. Even though Mr. Gross could be held at any prison facility due to the fact that his situation is not incompatible with that, he is being held at a military hospital; this is not because his health requires it, but to ensure for him the best conditions. The State Department on Thursday had called for the American's release, saying his health had deteriorated and he could no longer walk. 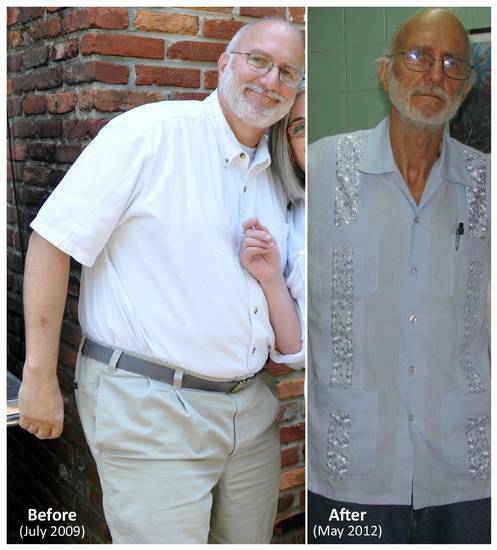 He has lost more than 100 pounds since his arrest. He suffers from severe degenerative arthritis and is no longer able to walk in his cell. He has other health problems that cause pain and require treatment. I shot these photos at near the José Martí statue in Havana's Parque Central. It looks like these folks are serious about what they do. Mis compañeros, además, no están ni olvidados ni muertos; viven hoy más que nunca y sus matadores han de ver aterrorizados cómo surge de sus cadáveres heróicos el espectro victorioso de sus ideas. My colleagues also are neither dead nor forgotten; they live now more than ever and their murderers must be terrified to see how the victorious spectrum of their ideas surges from their bodies. Above is a 2010 photo showing Cuban dissident leader Martha Beatriz Roque with Jorge Luis García Pérez, also known as Antunez. García has been in the news in recent days. On June 7, he testified by phone before a U.S. Senate subcommittee. 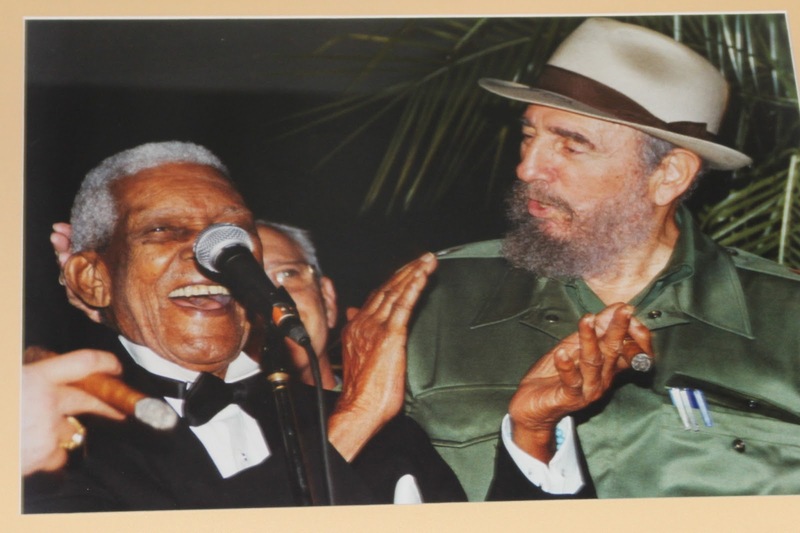 Cuban authorities detained him on June 9, according to his wife. On Wednesday, García was released from jail. Lawyers for Cuban Five: Journalists were "hired flacks"
The lawyers for convicted Cuban spy Gerardo Hernández asked a U.S. District Court judge to issue subpoenas to several Florida media organizations. These subpoenas would seek to show that the Government influenced the editorial process at these papers, whether and to what degree the papers were aware that their reporters and commentators were taking Government money, and how the papers responded to the discovery that the reporters were, in fact, being so paid. ...materials obtained by the Herald in its own FOIA investigation of the ties between the Government and journalists on the staff of El Nuevo Herald. The Herald was the first to discover the conflict of interest that arises when reporters take money from the U.S. Government, and its knowledge of this issue is likely to shed considerable light on the matters before the Court. Here is Rosa Cristina Báez, creator of the "La Polilla" blog and supporter of the Cuban government. She is shown in the office of her apartment in Villa Panamericana, east of Havana. Spotted just outside a Vedado apartment building. Asbestos removal at Interests Section? Did eagle get a makeover? FOIA update: Is paper trail a rabbit hole?